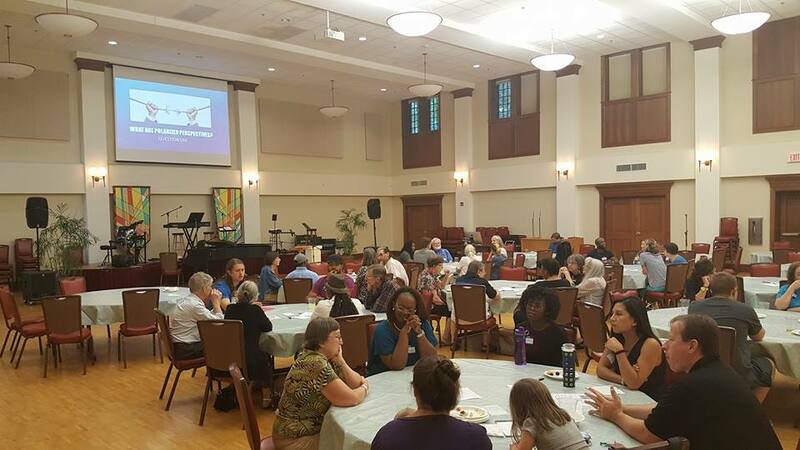 Since November 2013, Speaking Down Barriers has held ongoing, facilitated community dialogue on a monthly basis, beginning in Spartanburg, South Carolina. We have found that interracial dialogue can be healing and powerful for communities. However, it is not a complete solution. Community dialogue can also be damaging and traumatic, especially for marginalized groups. In community gatherings, marginalized groups are often asked to carry the burden of explanation or even proof regarding their experiences. Simultaneously, white individuals have often not explored their own whiteness or concepts of white supremacy before engaging in conversations about race, racism, intersectionality, and the history of privilege and power in the United States. This can create a community dialogue where people of different ethnicities are speaking past one another, even when using the same language. When these problematic dynamics surfaced in the community dialogues we host, Speaking Down Barriers tried hosting smaller in-group conversations in parallel to the larger interracial community gatherings we hold each month: Healing Us and Learning Us. This has proven effective. These sessions are well attended and participants described them as “needed”, “healing”, and “nurturing”. They equip participants with greater self-awareness, preparing them to enter the constructive and transformative interracial space of community dialogue. A space where our all of who we are can show up, meet face to face, and build together across our differences.